Three pit bull mixes stand in their kennels at Capital Area Humane Society. The shelter takes in more than 4,000 animals per year at its shelter in Watertown Township. Lauren Schwartz loves letting the kittens out of their kennels to play and be petted at the Capital Area Humane Society. Schwartz, a junior at Michigan State, loves going to the humane society to get away from the stress of academics and volleyball. 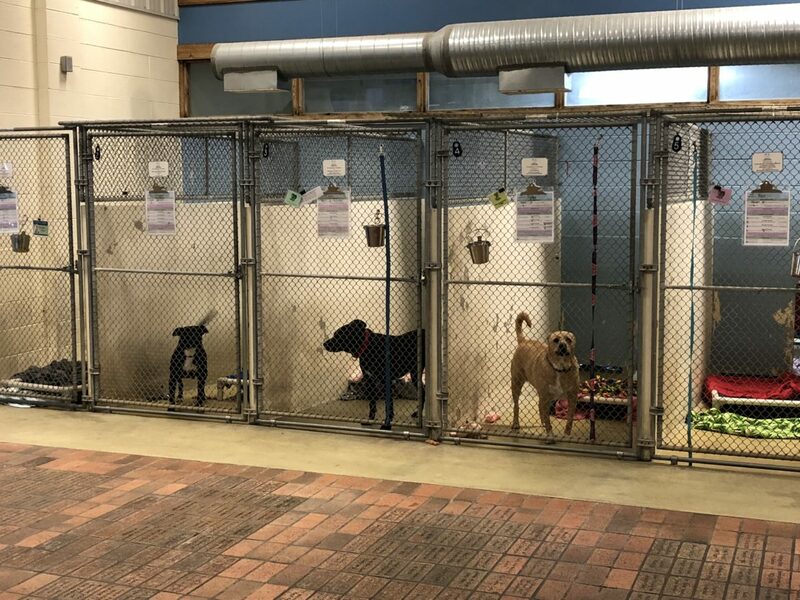 Lexi Rithenburgh, a Michigan State University grad who works at the Capital Area Humane Society, could not imagine doing anything else. Rithenburgh started working at the humane society three years ago. She helps assist with fundraisers and pet adoption events. “I used to work fundraising events and I enjoyed talking to people and educating them on how to adopt an animal or how to properly take care of an abandoned animal,” said Rithenburgh. Some of the services that are offered at the humane society include neuter clinics with reduced prices, rescuing animals, foster programs and vaccinations. Getting vaccinations cost between $10-$15 and surgery fees for cats range between $30-$55. “Seeing these animals being taken care of at a reduced price is heartwarming to me” Rithenburgh said. Pam Harden, a board member at the Capital Area Humane Society, grew up with a love for animals. Megan Tompkins, volunteer and a former MSU student, said she looks forward to any chance she can spend at the shelter.